It’s not a festival unless your head is adorned in something fabulous. Last year at Latitude festival I went for the classic floral headband and an animal print scarf but I knew, when I saw a gurning 18 year old wearing a Red Indian headdress, that I wanted more. That’s why I turned to Etsy for inspiration and tracked down these 5 super-badass headdresses. Are you sure you’re ready for them? This is the tribal headdress of my dreams. It’s obnoxiously humungous, it’s a gorgeous bright blue, it has ribbons, lace, pearls, feathers, the lot and it would most definitely hide the frizz and my 70s side fringe. I want to dance barefoot in the grass while wearing this. When it comes to floral headdresses, why go halfhearted? Why not invest in a full-on floral bonnet? Who wouldn’t want an entire garden of flowers crowning their head, swimming-cap style. Just think of the practicalities here, you wouldn’t have to worry about having clean hair or battling the frizz, nope, just tuck it under and strap yourself in. I honestly don’t know what to say about this one apart from, I love it. This was actually the first headdress I spotted and it was the antlers that sold me on it. There’s beads, ribbons, pears and floristry galore here. Definitely one to make you stand out from the crowd. This also makes me want pink hair. I’m not too sure exactly what this is but that doesn’t put me off. It’s got fringing, crochet horns, multicoloured ribbons and jingle bells. That’s right, actual bells that jingle. So there you have it. 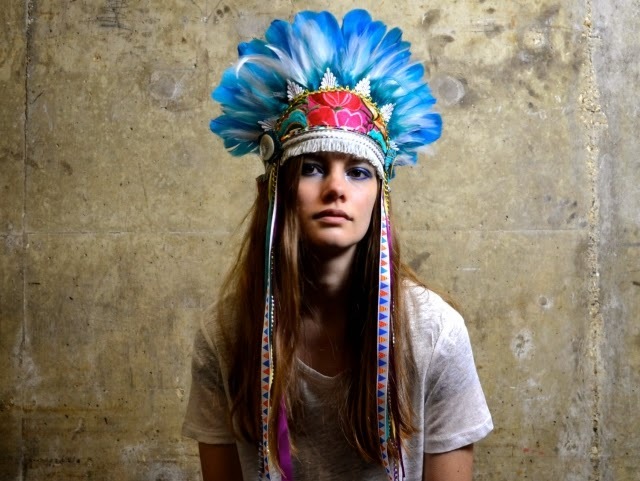 My top five most badass festival headdresses. Which would you choose?